The jeans of the Valentino Autumn/Winter 2006-2007 Show were inspired by Jean-Michel Basquiat. 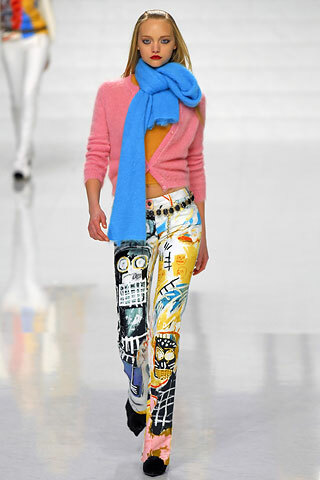 Some Jean-Michel Basquiat-inspired collections : Jean-Charles de Castelbajac Spring/Summer 1984 (dress « Physical Graffiti »), Louise Gray Autumn/Winter 2011-2012, Roberto Cavalli Autumn/Winter 2003-2004 (Jean-Michel Basquiat-inspired prints), Timo Weiland Spring/Summer 2012 Menswear, Yigal Azrouël Autumn/Winter 2011-2012 Menswear. Moreover, in the early 90s, Karl Lagerfeld designed a silk dress with a Jean-Michel Basquiat-style print for Chloé. 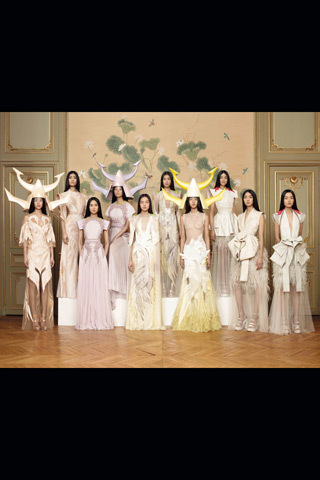 Dried flowers, seen by Kazuo Ohno, were the starting point of the Givenchy by Riccardo Tisci Couture Spring/Summer 2011 Collection. Lana Del Rey is the inspiration of the hair (by Sam McKnight) and makeup (by Charlotte Tilbury) of the Dsquared² Autumn/Winter 2012-2013 Show. Moreover, on February 19th, Mulberry launched the bag “Del Rey” (designed by Emma Hill, it will be available in May 2012), inspired by the singer. The colors of the Dior by Bill Gaytten Autumn/Winter 2012-2013 Show were inspired by Mark Rothko. Other collections with Mark Rothko-inspired clothes : Albino Autumn/Winter 2011-2012, Bottega Veneta by Tomas Maier Spring/Summer 2006 Menswear, Celine by Ivana Omazic Spring/Summer 2009, Etro Spring/Summer 2006, Marni by Consuelo Castiglioni Spring/Summer 2008, Martine Sitbon Spring/Summer 1998, Michael Angel Autumn/Winter 2011-2012, Narciso Rodriguez Autumn/Winter 2012-2013, Raf Simons Autumn/Winter 2008-2009 Menswear, Vera Wang Autumn/Winter 2006-2007. Batman’s emblem appeared in the Luella Spring/Summer 2008 Show. Other collections with Batman : Diesel® Spring/Summer 2012 (underwear « Batman » and « The Joker », for men, in collaboration with Warner Bros), GapKids Autumn/Winter 2008-2009 (T-shirt « Batman », in collaboration with Junk Food Clothing), Jeremy Scott Autumn/Winter 2011-2012 (« Batman » vest). Moreover, Lucas Ossendrijver from Lanvin Menswear designed a « Dog Batman » T-shirt for the collection inspired in part by Batman, launched in May 2010 by the Colette store, in Paris, to celebrate the 75th anniversary of DC Comics. 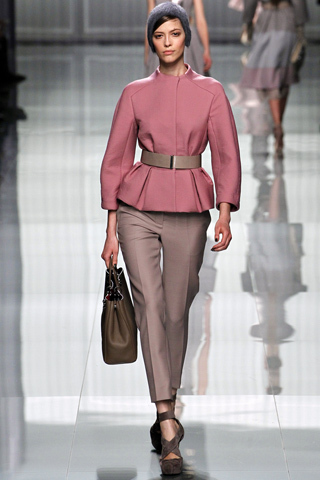 Rainer Maria Fassbinder’s « Querelle » is one of the inspirations of the MaxMara Autumn/Winter 2012-2013 Collection. Other « Querelle »-inspired collections : Givenchy by Riccardo Tisci Couture Spring/Summer 2007, Jean Paul Gaultier (« Querelle » has reinforced his desire to wear the matelot’s sweater that is omnipresent in his collections). The Rodarte Spring/Summer 2012 Show is inspired in part by Vincent Van Gogh. 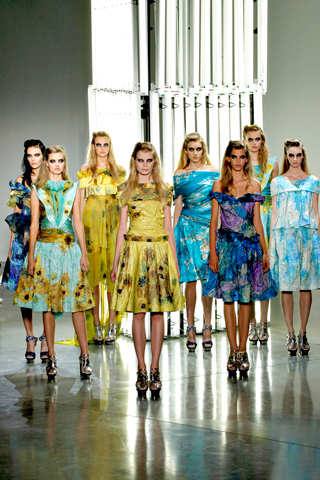 Other Vincent Van Gogh-inspired collections : Ashish Spring/Summer 2012, Fyodor Golan Spring/Summer 2012 (as part of the British competition Fashion Fringe), Ruffian Autumn/Winter 2010-2011, Tracy Reese Autumn/Winter 2009-2010, Yves Saint Laurent Couture Spring/Summer 1988.